Big Creek Expeditions will provide you the adventure of a lifetime during your next visit to the Great Smoky Mountains. Expert guides will get you and your loved ones outfitted with state of the art safety gear in preparation for the Class III and Class IV rapids you will paddle. After gearing up your guide will conduct a safety talk and teach you everything you need to know about white water before your adventure begins. After the safety talk hop on board the bus for a short scenic ride to the river put in on Waterville Road. The put in lies adjacent to the confluence of Big Creek and the Pigeon River. From here on you are the engine and your guide is the captain. Immediately after entering the raft you find yourself in the middle of a Class III rapid known as Brad’s Tooth followed shortly by BFR (Big Friendly Rock). Be sure and keep an eye on the scenery as you flow along with the rhythm of the river. There are many critters that call the river basin home and you never know what you may see. It is not unusual to spy river otters, deer, bear, or even bald eagles. The river twists and turns as it winds its way along the east side of Great Smoky Mountains National Park for five miles through the upper whitewater section. After safely returning to the outpost there is still more fun to be had. 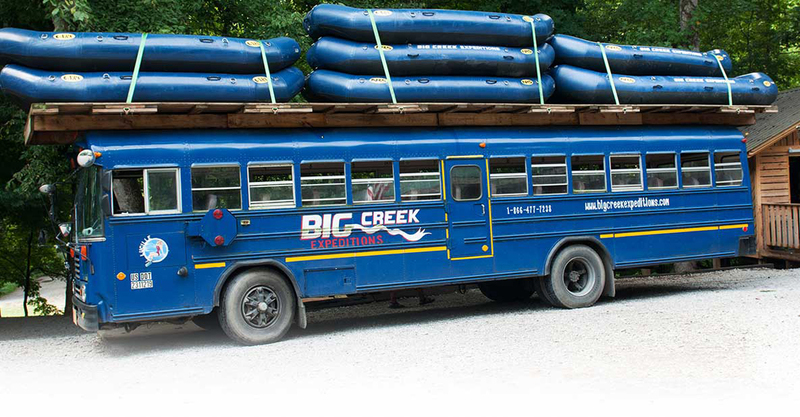 Big Creek Expeditions offers amazing zip lines and a scenic float trip. Rafting season depending on the weather begins in March and lasts through September. If you want to add some excitement to your next visit remember to call Big Creek Expeditions and let the experts guide you down the river.